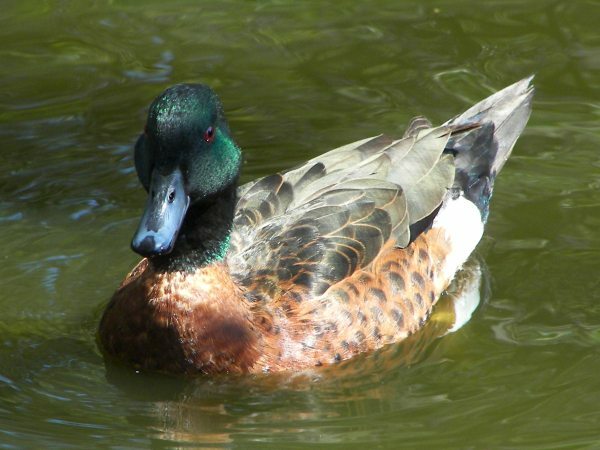 Chestnut teal are one of the two common species of teal in Australia (the other being the Grey Teal). The females are similar in appearance to the Grey Teal, but are a richer brown and not nearly as pale under the throat on on the cheeks. 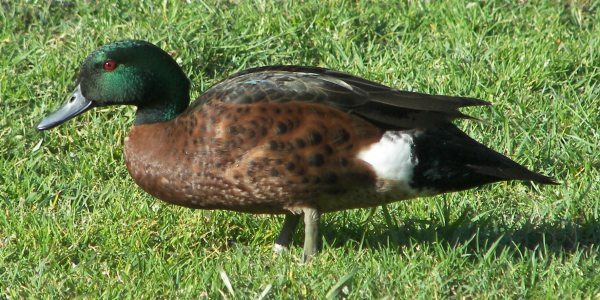 The male is unmistakable with its green head and chestnut flanks and breast. They occur mostly in the south-east of Australia with a smaller population near the south-west coast. They are found on lakes and pools, often moving to tidal mudflats and estuaries. The males are 45-50 cm, with the females being on average 5 cm shorter. 1-3: Royal Botanical Gardens, Sydney, 13/09/2009.